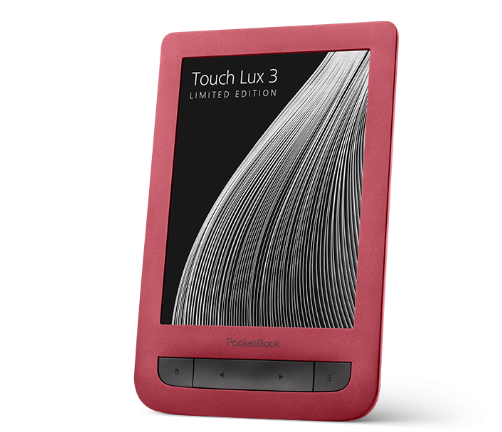 PocketBook Touch Lux 3 Ruby Red - the limited edition of the front-running model, is the synergy of perfect style and high comfort of e-reading. The design concept rewarded by Red Dot Design Award is now performed in deep ruby color, which embodied both classic and modern fashion trends. Choosing the color for PocketBook Touch Lux 3 Ruby Red the product designers got inspiration from the worlds’ most popular gemstones, as there is nothing more mysterious and flawless than the beauty created by nature. Thanks to a special paint spraying technology even after many years of usage, the e-reader will be in all the same delightful ruby color. Inside the stylish housing there are all modern elements needed for the perfectly comfortable e-reading. E Ink Carta™ display with HD resolution (1024x758 pixels) provides the high contrast of the e-books’ pages and ensures the excellent comfort for the eyes while reading. PocketBook Touch Lux 3 Ruby Red is equipped with LED frontlight, which means for the user – the complete freedom of reading day and night, at any lightning conditions. 8GB of internal memory and a microSD memory cards slot (up to 32GB) allow to have several thousands of books in a pocket. The powerful 1 GHz CPU along with 256 MB of RAM provides smooth pages turning and fast response of any application. 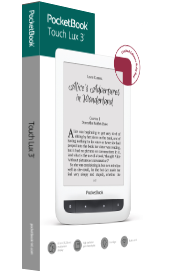 Just like PocketBook Touch Lux 3, the limited edition model supports 18 book formats without converting and 4 graphic - JPEG, BMP, PNG, TIFF. Built-in wireless Wi-Fi together with Dropbox, Send-to-PocketBook and PocketBook Sync services will allow to deliver any e-content on the device fast and easy, without having connection to PC.